Makes about 4 lbs. 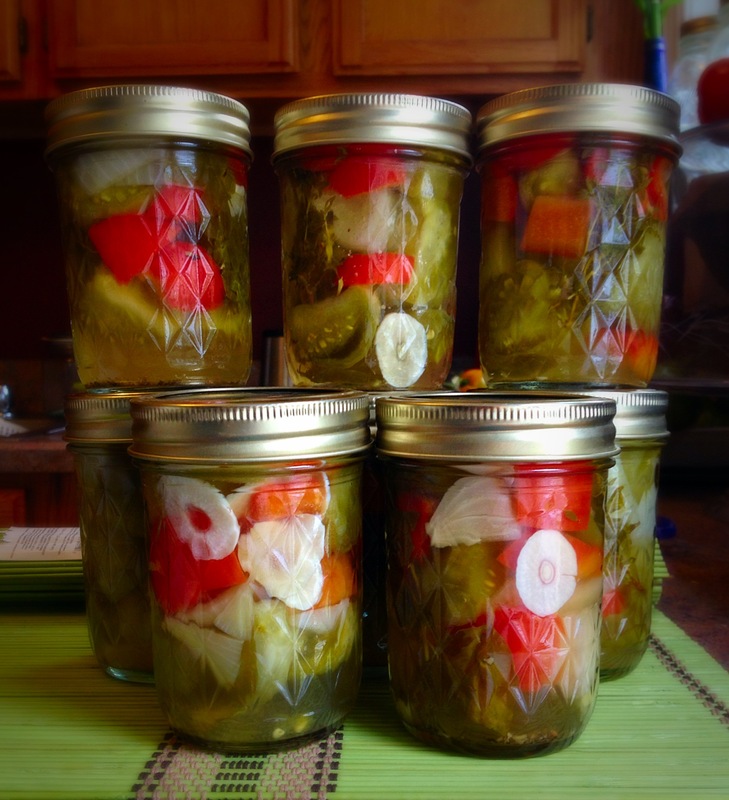 Can be canned into 8, 8 oz small jars or 2, 32 oz mason jars. Welp. Two of my Better Boys went belly up, leaving me with a ton of green tomatoes. Although I was a little disappointed, I did what I would normally do when life throws me lemons (well in this case, green tomatoes). I make lemon-aid! Wait. What? Oh, I mean I make Pickled Green Tomato Salad! 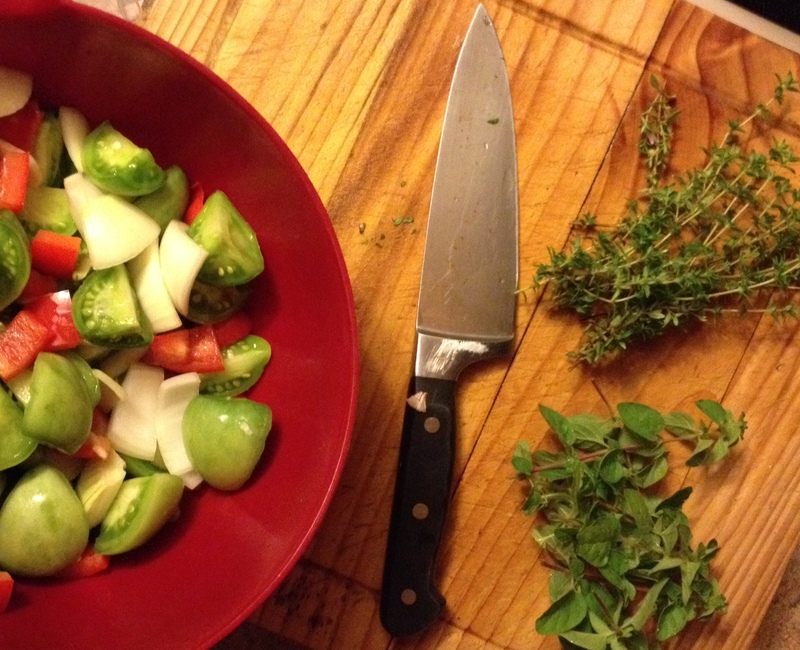 – 3 lbs of green tomatoes, cut in large bite size pieces ***A couple of hours before you start canning, toss the tomatoes in a bowl with 1/4 cup sea or kosher salt. This will draw out any extra liquid that could cause your tomatoes to become mushy. After at least 2 hours, drain liquid and rinse tomatoes thoroughly when ready to use. Pat dry. Okay, let’s do this. Begin with going to the link above and getting your big pot of boiling water going. Take the time to organize your equipment and everything you’ll need. Come on now, don’t make it harder than it has to be! It’s easy and you will be a professional when you’re done! Or at least look like one! In a large bowl toss the tomatoes, onions, red peppers, and garlic together. Keep the herbs close by. In a medium sauce pan, combine all the ingredients for your brine. Bring to a boil. After the salt and sugar are dissolved, turn down to a simmer and keep until ready to use. 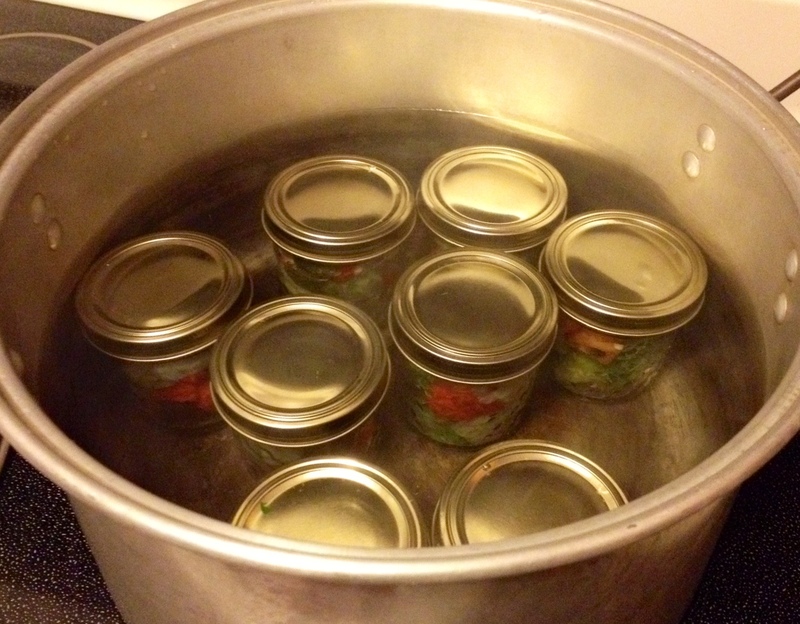 By now, your jars should be sterilized. Carefully remove the jars and quickly fill with the green tomato salad mix. Pack it in there! Make sure each jar gets a little bit of everything, including one spring of each herb. I like to squeeze the herbs down the side of the jar where they are visible. Presentation people, PRESENTATION! Now transfer the hot brine into a measuring cup with an easy pour spout. Fill each jar with the brine by just covering the top of the salad. Leave a little space at the top of the jar. Label and date each jar. I like to note any specifics also (like if some are spicy and some aren’t). It may also be a good idea to label each batch if you are making multiple batches of the same product. In case there is a problem or a surprising delicious discovery down the road, you know which jars came from the same batch. These can be ready to eat right away but just like with everything else, the flavor will develop over time. Refrigerate after opening. Today, I did mine in the 8 oz jars. Great for gifts! Enjoy! 3/8/2014 ***UPDATE*** It’s been a couple of weeks and I couldn’t wait any longer! I popped open my first jar today and had this Pickled Green Tomato Salad on Italian sausage sandwiches! Kind of like a relish! And it was soooo sooo delicious!!! This entry was posted in Breakfast/Brunch, Canning, Dinner, Food, Future Use, Gluten Free, Light, Munchies, Recipes, Salads, Sides, Technique, Vegan/ Vegetarian and tagged brine, canning process, fresh oregano, fresh thyme, garlic cloves, Green Tomato Salad, green tomatoes, kosher salt, mason jar, mason jars, onions, pickled, preserve, red bell pepper, sea salt, Tomato Salad, white vinegar. Bookmark the permalink.